There are movies you shouldn’t sleep on and then there’s Netflix’s The Devil All the Time. A movie that not only reads like it’s ready-made to join our best movies on Netflix list, but one that you should be getting excited about right this minute. Why? Well, take a dash of True Detective season 1, and a little bit of Lovecraft, then mix in some of Earth’s Mightiest Heroes and a certain Pennywise the Clown actor, and you’ve got all the makings of a sleeper hit. 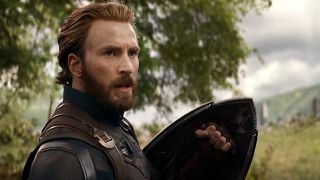 As revealed by Netflix’s See What’s Next account on Twitter, the movie stars Chris Evans, Tom Holland, Robert Pattinson, Bill Skarsgard, Mia Wasikowska, and Eliza Scanlen. If the Devil All the Time cast doesn’t get you hot under the collar, then what goes on in the story might just do it. “A midwestern gothic involving a serial killer couple, a faith-testing preacher, and a corrupt local sheriff in a story told across two decades,” reads the synopsis, drawing us in with potential images of Lovecraftian horror and those sorts of eerie landscapes you only ever seem to come across in rural Americana. While the synopsis doesn’t tell us a whole much, we do know that it’s based on a 2004 book of the same name, by Donald Ray Pollock, which sees the story span across two decades. Feel that wave of nostalgia? That’s pure True Detective season 1 right there. There’s the soon-to-be-mad Willard Russell (no relation, honest), and his dying wife Charlotte, plus serial killer couple Carl and Sandy (Bill Skarsgard would be perfect here) and, along the way, we come across presumably Tom Holland’s character, Arvin, son of Willard and Charlotte and Lee, the sheriff, who could very well be played by Chris Evans, though there’s been no confirmation as of yet. So, reading between the lines, we’re potentially getting Captain America tracking down Pennywise the Clown in a big-budget Netflix True Detective-style movie. And Spider-Man’s his son. Oh, I’m in. I’m all in. Just don’t expect it to come out this year – IMDb has it down for a 2020 release. Boo! I think it's safe to say we can mark this one down as one of the upcoming movies to keep an eye on over the next 12 months.